Tanzanian albino children at a picnic organised by the Tanzania Red Cross Society in the government-run school for the disabled in Kabanga. There are now nearly 50 albino children, youngsters and single mothers sheltering in Kabanga, which also houses children with disabilities and hearing and sight problems. Many of the albinos only just escaped their villages with their lives and tell harrowing stories of killing and mutilation. One small boy says his non-albino mother’s hand was severed by albino hunters armed with machetes after she tried to prevent them seizing him. A teenage girl in the female dormitory at the Kabanga school. The school has now completely run out of space, but vulnerable albinos are still being brought in by the police from as many as 200 kilometres away. The Tanzania Red Cross Society has been able to provide blankets, mosquito nets, soap and mattresses left over from its programme to assist Burundian and Congolese refugees in camps nearby, including personal contributions from volunteers but there are concerns over future supplies. A woman visiting the Dar es Salaam cancer institute hospital, Tanzania, near the Kabanga school, which also hosts the small office of the Tanzania Albinos Society, who estimate there could be up to 170,000 albinos living in Tanzania. Most of the albino children at the school already exhibit the chronic skin damage that is likely to blight and shorten their lives. 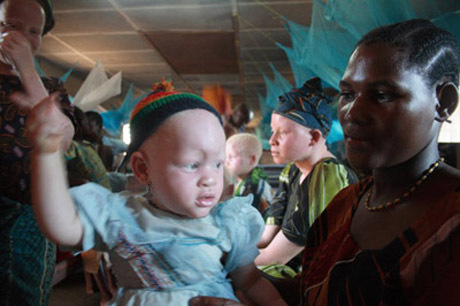 "Only two per cent of albinos live beyond 40 years [of age]," according to Tanzanian cancer specialist Dr Jeff Wandi. 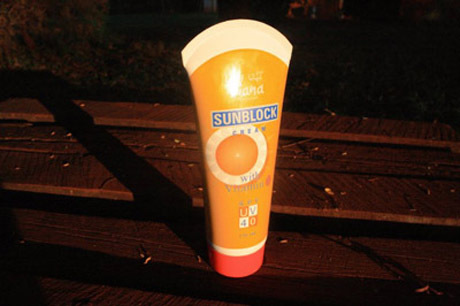 High-factor sunblock of the kind distributed by the Tanzania Red Cross Society at Kablanga school. Some of the sunblock is from donations made by Red Cross volunteers, and the school desperately needs a dependable supply of sunblock if it is to protect the albino children from skin cancer. A mother and her child at the picnic organised by the Tanzania Red Cross Society. 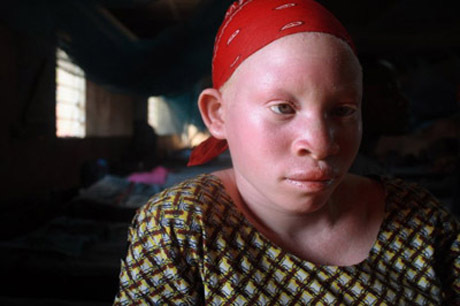 Older albino women, have in the past, been targeted in eastern Africa, because of the mistaken belief that they were witches. A teacher cares for a toddler in the female dormitory at the school for the disabled in Kabanga. 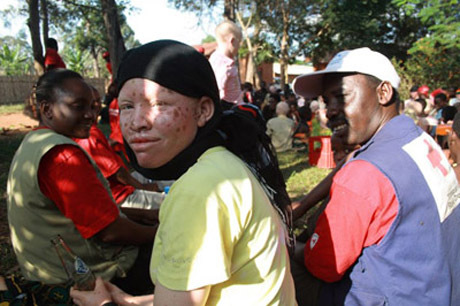 Persecution of albinos in Tanzania, and neighbouring countries, remains high. Though at least 200 people have been arrested over the trade in Tanzania, none has been convicted so far. The government has revoked the licenses of traditional herbalists, but it has apparently had little impact, with many continuing to practice regardless. 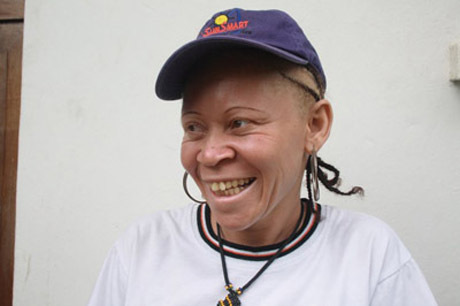 In Tanzania albinos are still living in fear of being attacked or killed after nearly 50 were murdered in the past two years. It is thought that they are being killed because of the belief that certain body parts of albinistic people transmit magical powers. Witch doctors are willing to pay a lot of money for the body parts to create potions and tinctures for their clients. 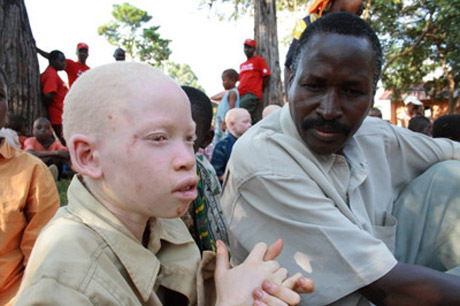 So far this year at least 12 albinos have been murdered in neighbouring Burundi. Al-Jazeera has reported that one of the murderers received $240 for the body, in a region where the annual wage can be as little as $10. In response to the murders the Kabanga school for disabled children has given the children sanctuary from the threat of violence since 2007, and seen a growing number of children having to live there. hy is the world so silent.When will we wake up,it is as if we are asleep.This terrible thing needs a voice a very load clear .I hopethis will come quickly for these poeple.We cannot ignore this. 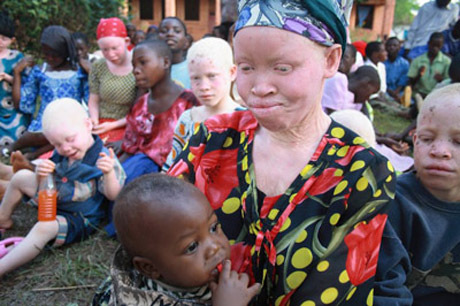 Nearly 50 albinos have been killed in Tanzania over the past two years.